Spend time practicing the L-sit by itself before working it in with your pull-ups or chin-ups. The L-sit turns a chin-up or a pull-up into a brutalizing core exercise. The entire body must maintain an adequate amount of tension; otherwise, the L-sit won’t hold. This movement requires a strong set of abs and a strong back; it’s surely one of the finest full-body movements anywhere. To get to the level required for this exercise, you need raw strength, total body control, and technical proficiency. Oh, and a lot of patience, too. These movements sometimes take years to develop. If you think you’re going to get to this point overnight, you’re in for a disappointing morning. The L-sit pull-up/chin-up is a fantastic exercise for the front and the backside. 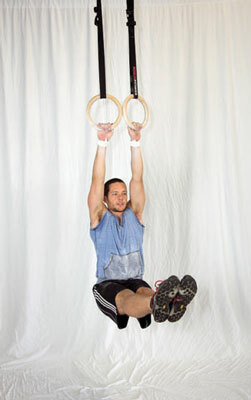 1Grab hold of a bar with your hands shoulder-width apart and palms facing you. When your grip is secure, assume a dead hang. 2Raise your legs up to 90 degrees so your body forms an L.
Lock your knees and point your toes. 3While holding the L-sit, perform a full chin-up/pull-up. To gain control and to increase its effectiveness, work this movement slowly.